It seems Google+ and Facebook have started some sort of “cold war”, with Google preventing a former employee (now with Facebook) to add more people to his circles, and Facebook blocking Google+ ads on its social network, while media and social media experts start showing their preference by publishing either too positive or too negative articles about G+. Some independent forums also are not liking some form of censorship in G+. While the new “War of the Roses” goes on, I was wondering how Google plus is affecting – or may be affecting- current and forthcoming marketing efforts. – Is there any risk companies should evaluate when deciding about their social media marketing dollars? – Are there countries where Facebook-based marketing campaigns could be at risk? – are there countries whose Facebook campaigns are “safer” and not impacted by a migration of fans to G+? In order to answer these questions, I started comparing some figures about Facebook users growth by Country, and compared the last two weeks of June (before G+ was launched) with the first two weeks of July (when G+ was launched). Interesting enough, in the past two weeks, while Google got 10 million new registered users since its launch, Facebook’s new users grew less than the previous 2 weeks. 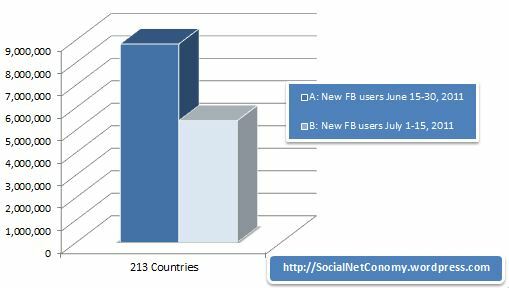 As shown in the picture above (SocialNetConomy, 2011), out of the 213 Countries where Facebook is present, new users registrations declined by some 3.4 million during the past two weeks. Which Countries got the biggest decline? The figure below represents the top 20 countries in Facebook (those with the majority of users, regardless of the Internet penetration in that Country). 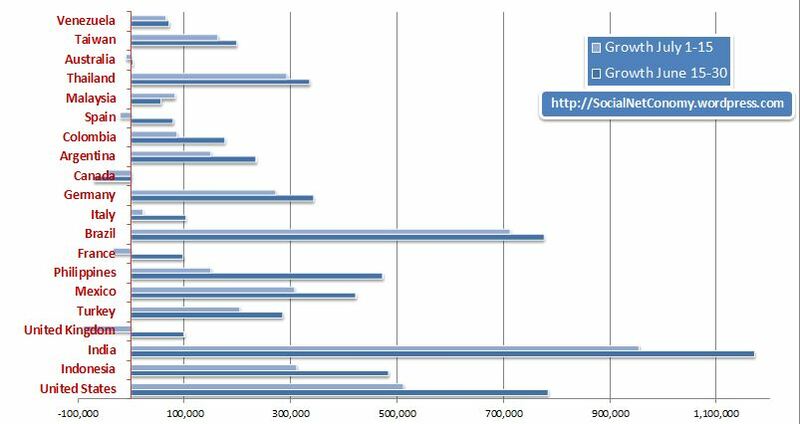 Top 20 countries decline, in terms of new Facebook registrations as a total, is slightly over 2 million. Some countries slowed down more than others – and there is some confirmation in the recently launchedunofficial Google+ statistics website. Data show a vast majority of countries experienced a slowdown – between 0.2 % and 1.3% of their overall Facebook users base for the top 20 countries. The table shows the difference between the number of new users registered in the June 15-June 30 (2011) timeframe, minus the number of new Facebook users registered in the the past two weeks (July 1- 15, 2011, after G+ launched). The table shows the top 10 “declining countries” (additional data are available on request). We are still at the beginning of G+ vs Facebook, but surely something more to consider on the marketers’ plate is how to keep people engaged on the platform they invested on. This could also be a good reason for Facebook to get closer to those brands whose pages may be keeping their fans on Facebook and that may keep Facebook growing. It could be a win-win if thhey manage to get closer to each other and become more “social”.